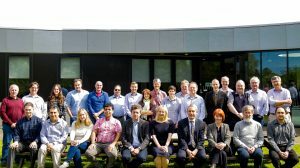 SKA Organisation Headquarters, 25 January 2019 – The international Signal and Data Transport (SaDT) engineering consortium has concluded its work to design the complex system of networking that forms the backbone of the SKA. The consortium’s work also included the design of clocks and a custom-made frequency distribution system. A University of Western Australia (UWA)-led effort was selected for the synchronisation of the SKA-mid dishes in South Africa while a Tsinghua University-led design was selected for the SKA-low antennas in Australia (read more here). Read more about the SKA-mid Phase Synchronisation System in this technical paper.